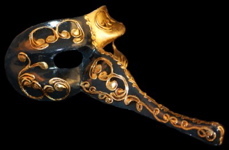 Elicit chuckles from those on Bourbon Street, get into character for the next masquerade event, or get ready for a theater production with the Nasone - Gold/Black - Hand Made Venetian Nose Masquerade Masks. 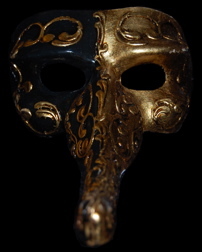 Our Nasone Venetian masks have the elaborate long nose that Nasone Venetian masks are known for. This identity concealing accessory is split down the middle with black on one side and gold on the other. Opposite colored embellishments adorn the defined brow, cheekbone and long nose. 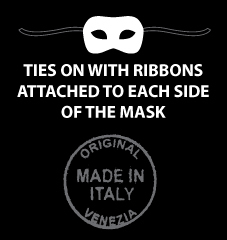 As a final touch, our artists in Venice, Italy, add satin ribbons at the sides of our masquerade masks to ensure your identity remains obscured. Create your own unique masquerade costume by adding a black, gold, or red hooded cloak made by Venetian Mask Society.